Amanda has been in the optical industry since 2001 as an Optometric Assistant and Optician. 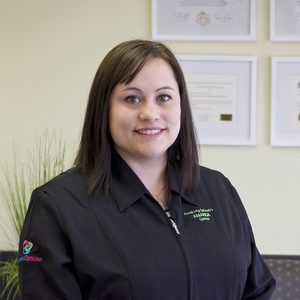 She brought her outstanding knowledge and experience to Armstrong Optometry in 2011. Amanda is an expert at optics and lens design, helping with frame and lens selections, and she manages our in-house lab. She can also fit all kinds of soft contact lenses including toric and multifocal designs. Amanda has a young daughter and enjoys snowshoeing.